Pentacon announces three new digital cameras in the Praktica camera series, the Luxmedia 10 X-3, the Luxmedia 6203 and the DCZ 6.3. Top of the range is the 10 Megapixel Luxmedia 10 X-3. where X3 stands for X-travagance, X-cellence and X-quisiteness. The 6 Megapixel Luxmedia 6203 comes with 3x optical zoom and a 2,4" monitor. 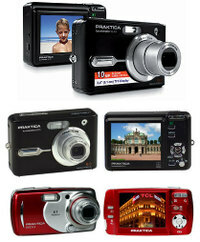 The DCZ 6.3 comes with 6.1 Megapixels (8,0 Mp interpolated), 3x optical zoom and a 2.5" monitor. Each camera comes with a USB cable, a TV cable, a software CD, a pouch, a wrist strap, a manual and a pair of batteries.